San Pedro de Pinatar holidays take you to a delightful resort on the peninsula between the Mediterranean and the Mar Menor on the Costa Calida. Holidays to San Pedro de Pinatar can be enjoyed at any time of year as the summers are long and hot and the winters mild. The busiest times are between April and October with temperatures rising from mid-twenties to the low thirties at the height of the season. With a sandy beach and safe waters for children, it is unsurprising that our cheap San Pedro de Pinatar holidays are snapped up by families. The waters of the lagoon are noticeably warmer than the Mediterranean and they give greater buoyancy which aids the confidence of weak swimmers. A wide variety of water sports are available for the more energetic visitor. 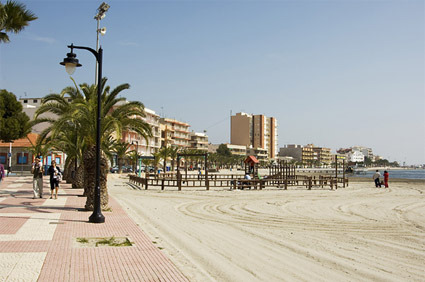 Holidays in San Pedro de Pinatar have broad appeal as there is much to see and do in the area. It is only thirty miles to the stunning city of Murcia and a visit here should not be missed. Golfers have a choice of courses in the vicinity. With good accommodation and restaurants catering for all tastes our bargain San Pedro de Pinatar holidays are sure to please. There are shops for all your holiday essentials as well as gifts and souvenirs. There is nightlife to suit every mood from lively bars to romantic hideaways. Whether you want to relax in mud baths or skim the surface of the bay on skis, we have low cost San Pedro de Pinatar holidays to suit. For more information and to view our best San Pedro de Pinatar holiday deals, please use the search facility.